This Halloween Friends pdf sewing pattern includes patterns for a Bat, a (not so scary) Witch, a Ghost, a Pumpkin and a super sweet Skeleton. 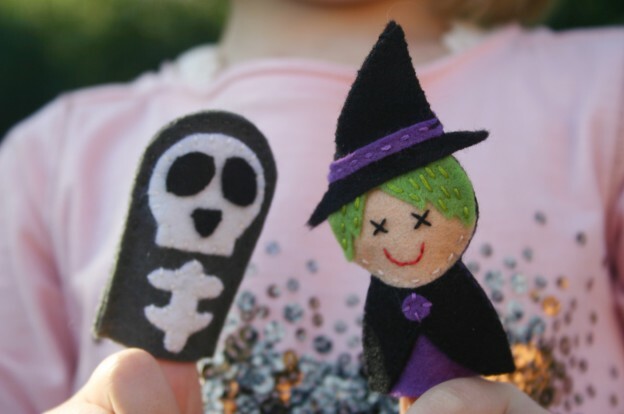 Finger puppets are such a lovely way of encouraging creativity and imagination in children. They are perfect for story time, creative play, quiet time and long journeys! 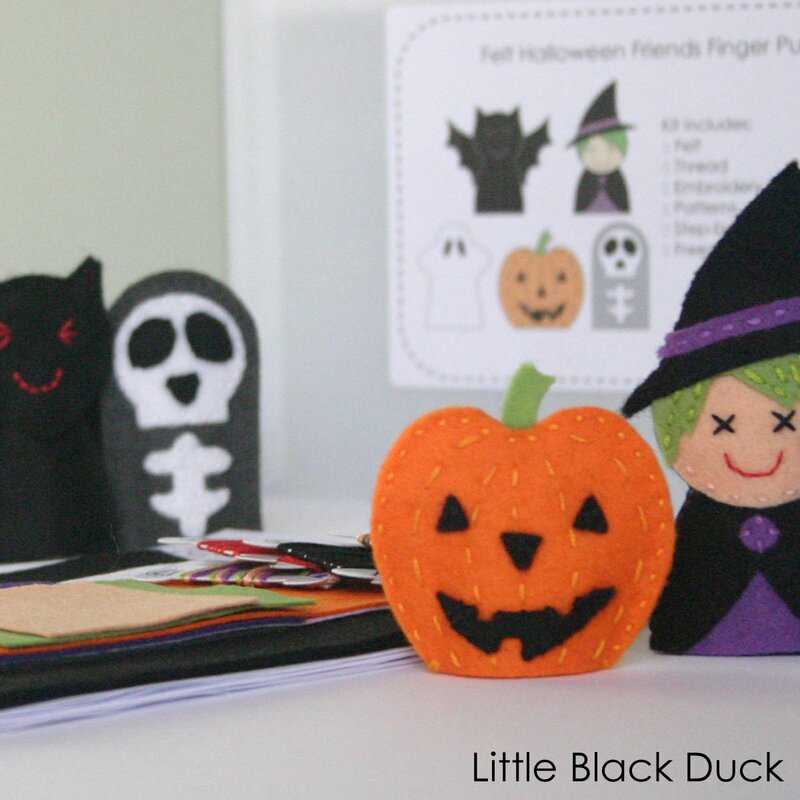 This Halloween Friends pdf sewing pattern features a Bat, a (not so scary) Witch, a Ghost, a Pumpkin and a Skeleton. These finger puppets can be made from small quantities of felt and can be made using some basic hand sewing techniques. 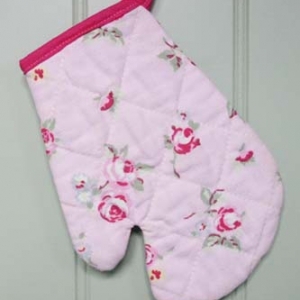 There is no glue required and no need for a sewing machine so they can easily be made by a confident youngster or an adult. This pdf pattern is 7 pages long and the digitally drawn pattern pieces for all five finger puppets can be printed off on two pages. There are lots of clear, digitally drawn images to support the step-by-step sewing instructions. Your pdf pattern will be available to download as soon as your PayPal payment has been accepted. In order to read the pdf pattern you will need a copy of Adobe Reader on your computer. Adobe Reader can be downloaded for free directly from www.adobe.com. If you are an Apple user I understand that you don’t need Adobe! 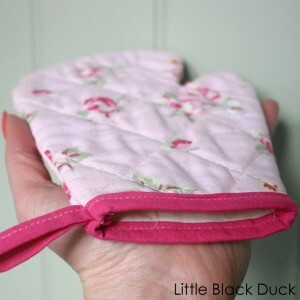 This pattern is copyrighted to Victoria Peat/Little Black Duck Ltd and is for personal use only. You do not have permission to re-distribute the pattern or to sell items made from this pattern. Please be aware there are no refunds on downloaded digital patterns for any reason. 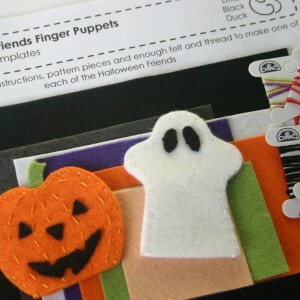 This Halloween Friends sewing kit is perfect for a little Halloween fun. This kit includes everything you need …. except scissors! Halloween wouldn’t be the same without a pumpkin and this pumpkin is definitely easier to make than carving your own!